The S1600/1400 series pH meters work with a corresponding range of solid state ISFET pH sensors that offer accurate and reliable pH measurements for demanding applications. The SI600 meter contains extensive features required for high-end pH measurements and the probes are available with a variety of tip shapes to match your application. 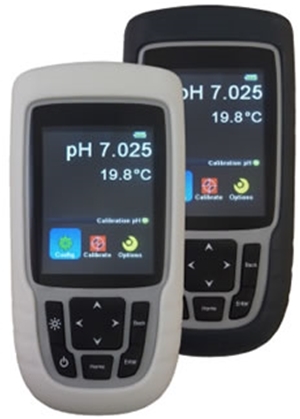 The SI600 meter’s advanced electronics can achieve a resolution of 0.005 pH for very sensitive pH measurements. The meter’s ability to offer reliable pH measurements in demanding conditions is the result of the robust ISFET sensor integrated into our probes. Unlike glass pH electrodes, ISFET pH sensors are highly resilient and do not require wet storage. A large backlit 3.2” LCD colour display allows convenient determination of measurement values and provides clear information for operation. The pH value is displayed in a large font and is continuously displayed during menu operation. The intuitive and user friendly interface allows quick access to the meter’s advanced features and settings. Large ergonomically placed buttons facilitate easy menu navigation and selection of options. The intelligent calibration wizard simplifies the calibration process, reducing calibration time and the chance for errors. A full calibration report is displayed at the end of the procedure. The SI600 supports 1-, 2-, 3- and 5-point calibration. The meter also contains various settable alarms that provide an audible warning when measured pH or temperature values are out of range or when maximum time between calibrations has been exceeded. For advanced users, bias setting can be manually defined. The S1600 hasan IP65 rating and a rubber boot that helps to absorb shocks. The light-weight and compact body makes it highly suitable for field use and handheld applications. The meter has also been designed so that it is stable when placed on a table, making it well suited for laboratory table-top use. The meter’s three AA-batteries can be recharged using the supplied AC adapter or exchanged with spare batteries when no power source is available. The SI600 has advanced data acquisition capabilities, that permit extensive storage of measured data points and continuous data logging at a user defined time interval. Stored and logged data points can be transmitted to a PC through the USB port and with suitable software the meter’s momentary pH value and temperature can be queried. Batteries 3 x AA NiMH 2600mAh, Replacable , rechargeable via USB, recharge time approx 8 hours.